The full-frame mirrorless camera market just got a lot more interesting, with Canon and Nikon both jumping in with both feet. Nikon has launched two new models, called the Z7 and Z6, while Canon has officially introduced the EOS R. The timing of these launches sends a strong message from the two biggest camera manufactures — full-frame mirrorless is the way forward, and it’s high time Sony had some good competition. While Canon and Nikon took their time to enter this space, Sony has had a good five-year head start, and already offers a wide bouquet of models for different use cases and budgets. Canon still commands the largest marketshare for interchangeable lens cameras, followed by Nikon and Sony. While DSLRs still outsell mirrorless cameras, this gap is steadily getting smaller, which is why both camera giants have finally decided to take a leap in this space. Canon invited a select group of publications to its headquarters in Tokyo, Japan for a hands-on session with the EOS R, and Gadgets 360 was one of them. We also had a chance to speak with some of the top executives from the business and product teams for a better understanding of Canon’s vision for the new EOS R and the new RF mount system. Let’s start with the body of the camera. The EOS R doesn’t feel a whole lot different than a regular DSLR, and that’s mainly thanks to its massive hand-grip. The body itself is quite slim since there’s no mirror, but the hand-grip has stayed chunky which makes it very comfortable to hold. This is important since most of the new RF lenses are quite big and heavy. The added surface area inspires better confidence when you need to shoot with one hand. Canon has used magnesium alloy in the construction, with high-quality plastic and rubber inserts, which makes the EOS R feel very premium. The EOS R has some weather-proofing too, with all the ports covered by rubber flaps. The flaps are a little flimsy but seem to do a decent job at keeping moisture out. We used the camera outdoors in a heavy drizzle and didn’t face any problems. You get a good selection of ports — separate headphone and microphone sockets, Micro-HDMI, and a USB Type-C port, which according to Canon, lets you charge the battery directly. He also explained that Canon’s engineers did look at various design options such ashaving the two slots side by side, stacked vertically, etc. He added, “Given the size level we wanted [to achieve], we didn’t want to make the camera bigger or thicker. With all that in mind and also the heat issues, we couldn’t resolve that, so we decided to go with the one slot.” Kaihara made it a point to state that Canon is currently working on trying to find the ideal dual-slot solution for a smaller camera body, so in all likelihood, we can expect the company’s next RF-mount camera to rectify this situation. Vloggers will particularly appreciate the fully articulating touchscreen. The 3.15-inch panel has good outdoor legibility and a sharp 2.1 million dot resolution, and is responsive to touches. The LCD can also be used as a touchpad for shifting the focus point when using the EVF. Speaking of which, the 0.5-inch OLED electronic viewfinder produces a really sharp picture and accurate colours, which makes it reliable for framing your shot. We didn’t notice any blackout either with continuous shooting when using either the EVF or the LCD. 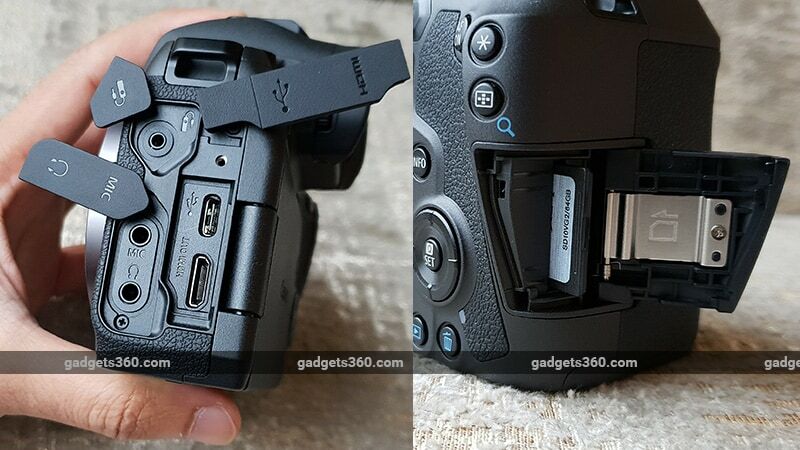 Canon has taken a slightly different approach than usual in designing the EOS R’s controls. Instead of merely cutting the mirror out of one of its popular full-frame DSLRs such as the EOS 5D Mark IV and calling it a day, the company has chosen to switch up the buttons and dials on its new camera. Looking at the top right, you’ll notice that’s there’s no concept of a ‘mode dial’ anymore. 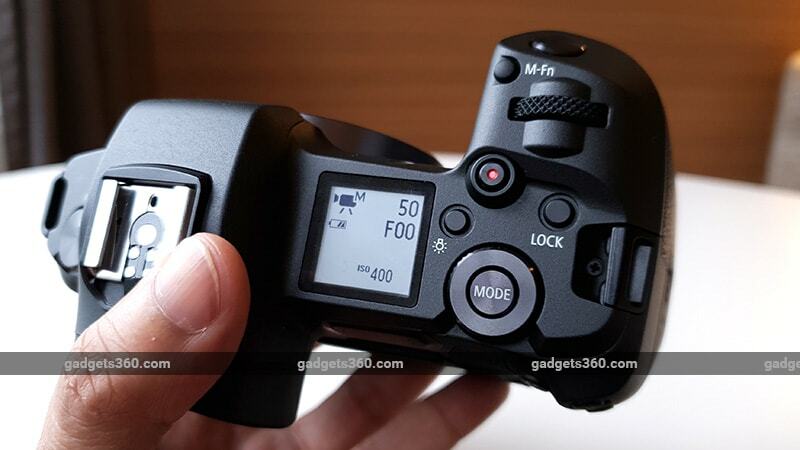 Instead, you press the ‘Mode’ button and then use the horizontal command dial to cycle between shooting modes. You can also press the ‘Info’ button on the back to switch between video shooting modes. The top-facing display lets you know which mode you’re in, and even when the camera is off, it shows you the last used shooting mode. It didn’t take long for us to get used to it, and it almost became second nature by the second day. There aren’t any custom function (Fn) buttons either, but that’s okay since you can reprogram most of the existing buttons and the four-way navigation pad to a function of your choice. Canon DSLR users might be annoyed by the lack of a joystick, which is typically used for shifting the AF point when framing shots. 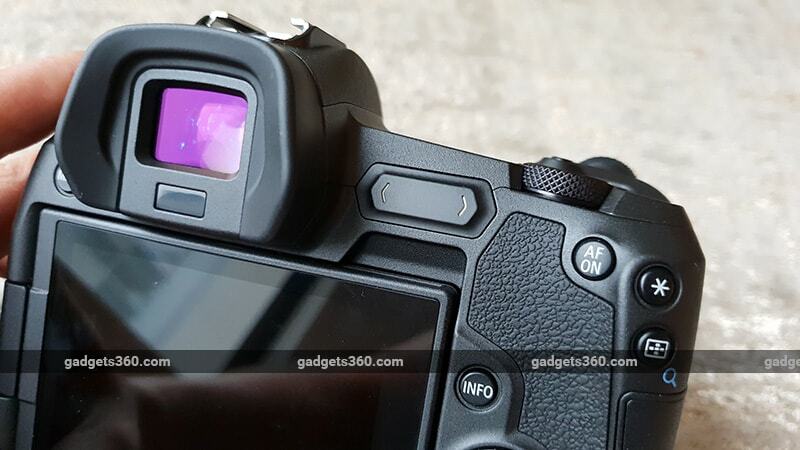 Instead, Canon has replaced it with a touch bar, which is a small programmable strip next to the viewfinder. You can slide your thumb across it to adjust the ISO, exposure, shutter speed, etc, or tap either end of it to toggle a feature on or off. In order to prevent accidental presses (which can happen) you can temporarily lock the strip. It takes some getting used to for sure, but it works well. The EOS R also has Eye-AF that locks focus on a subject’s eyes, but this currently only works in the single-shot drive mode. Accompanying the new EOS R are four new RF lenses. Canon has also announced adapters that let you use your existing EF and EF-S lenses with the new camera. We didn’t get a chance to try these adapters, but some of them have programmable control rings and even provisions for a slot-in filter, so you can drop in, say a neutral density filter irrespective of the attached lens. All RF lenses have a control ring on the front, which are programmable, and let you change settings like the aperture. Out of the four lenses, we spent the most time with the 50mm f/1.2 and the 24-105mm f/4. The 50mm is a fairly big and heavy lens, and even though it lacks stabilisation, the large aperture makes up for it. The EOS R boasts of being able to focus at -6 EV, but this is only possible with an f/1.2 lens, using the centre AF point and one-shot AF. We tested this in very dim light, where we could barely see the subject clearly with our naked eye, and the EOS R managed to lock focus without any hunting. At narrower apertures in similar lighting conditions, we did notice quite a bit of focus hunting, which is expected. The 24-105mm offers more versatility, as you get a bit of zoom, lens stabilisation, and a constant f/4 aperture throughout the focal range. 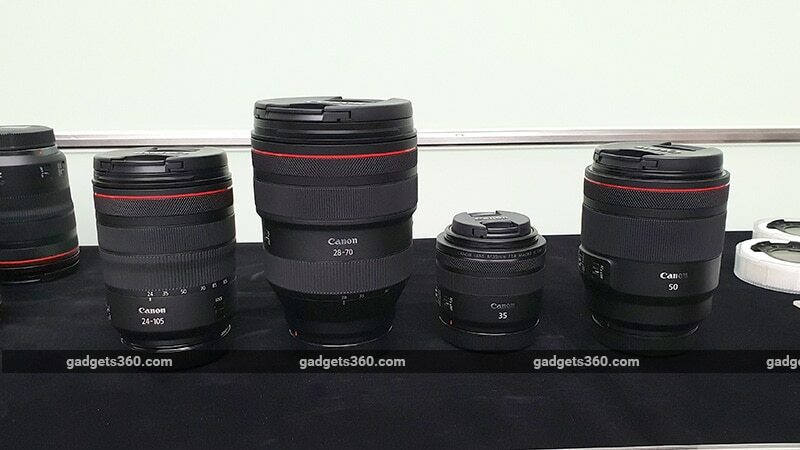 It’s smaller and lighter too, compared to the 50mm, and will no doubt be the starter lens of choice for anyone picking up the EOS R. The two other lenses are a 35mm f/1.8 macro, and a 28-70mm f/2 zoom lens, which is the biggest and heaviest one in Canon’s current RF lineup. Unfortunately, we didn’t get the chance to test these but hopefully we’ll be able to try them when we get this camera in for a full review. The EOS R has some pretty impressive specifications. You get a 30.3-megapixel full-frame CMOS sensor, Canon’s DIGIC 8 image processor, and a massive 5,655 selectable AF points. The ISO range is 100-40,000 and expandable, burst shooting can go up to 8fps, and the company’s famed Dual Pixel AF system is also supported. The EOS R features Wi-Fi and Bluetooth connectivity, which lets you transfer images (either original or reduced size) directly to your smartphone, as they are shot. You can record video at up to 4K at 30fps, with support for Canon’s C-Log profile. In practice, the EOS R is easy to handle, even with the new button layout. There is a small learning curve, even for experienced DSLR users, but once you have all your shortcuts and toggles in place, you can quickly master it. The buttons are responsive, the EVF offers a sharp picture for framing, and depending on the lens, the camera is pretty easy to handle. Image quality seemed very good, at least in our brief initial experiences. Under good light, images came out sharp and colours were nicely balanced, with no real visible anomalies. The camera handled noise very well in low-light, even at high ISO levels. We will be putting the EOS R through our own ISO tests once we get a review unit, but for now, it looks promising. However, there are some features that are noticeably absent from the EOS R, the biggest of them being in-body or sensor stabilisation. Nikon and Sony have both managed to incorporate 5-axis sensor stabilisation into their full-frame cameras, but Canon has left it out. This means that you will need to rely on the stabilisation capabilities of your lenses, but only two or the four RF lenses that have been announced so far are capable of this. For video, you’re left with digital stabilisation, which might work well enough, but at the cost of a slight crop to the image. Burst shooting tops out at 8fps, which is decently quick, but this only works with One Shot AF, and without tracking focus. This means focus is locked only on the subject’s position in the first frame when you start shooting. For moving subjects, you’ll need Servo AF, but this drops the burst speed to 5fps. However, if you use Servo AF along with face and object tracking, the burst speed drops even further. 5fps is still decent but it might not be ideal for wildlife or sports photography. This is something we’ll be testing when we get to use this camera over a longer period of time. Another thing we noticed is that the EOS R takes a while to save all those frames to the SD card, especially if you’re shooting in the JPEG + RAW or C-RAW modes. We ended up waiting for a good number of seconds before we could start shooting again, and that was with a UHS-II memory card. Dual Pixel AF works wonderfully in videos. You can shoot at 4K at up to 30fps, 1080p at up to 60fps, or 720p at up to 120fps. Shifting the focus is smooth, and the video quality seemed quite good. C-Log lets you shoot with a flat colour profile, which lets you grade it later in post. However, the EOS R has an annoying 1.7x crop when shooting at 4K, even with the native RF lenses. This is quite disappointing, as it completely throws off your framing and also limits the types of lenses you can use depending on where you’re shooting. The crop essentially gives you a zoomed-in view of your subject, which might make framing difficult in some scenarios. 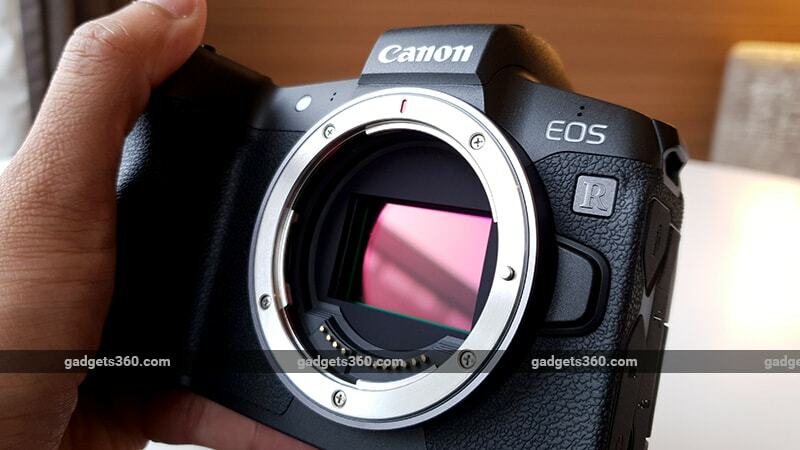 Canon’s brand new EOS R full-frame camera might seem like a mirrorless version of the 5D Mark IV due to the fact that it has a 30.3-megapixel sensor, but these two models are completely different. After spending some time with the new EOS R and hearing what the executives at the company had to say, it’s clear that it wasn’t designed to replace any particular Canon DSLR, but rather complement the lineup. What we’re eagerly waiting to see is how quickly and aggressively Canon iterates with its new RF platform. Let’s face it, Canon and Nikon are both late to the party that Sony has a been hosting for the past five years. Plus, Canon only has one model in the market right now, compared to Nikon’s two and Sony’s four (not counting older ones that are still available). Then, there’s the matter of price. Canon’s debut model retails for $2,299 (roughly Rs. 1,57,700), which puts it up against the Nikon Z6 and the Sony A7 III — two cameras that are already offer more features on paper. The EOS R definitely has some promising features, and from our initial testing, it seems to produce high-quality pictures too. We will be bringing you a full review soon, so stay tuned. Disclosure: Canon sponsored the correspondent’s flights and hotel for the trip to Japan. product We go hands-on with the Canon EOS R, the company's first full-frame mirrorless camera.